Here’s a fun new way to help your clients learn and remember key nutrition lessons. Everyone gets so confused about how to eat healthfully. In today’s society, proper nutrition comes from following MyPlate, reading food labels, and eating the best options from each of the food groups. 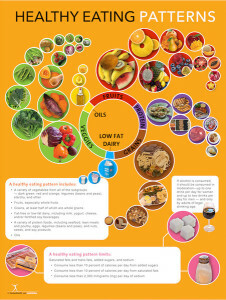 The Nutrition at a Glance poster shows key nutrition lessons in three easy steps. Plus, each step has an exciting visual of food! Step 1: Let macronutrients put their best food forward! Think lean, high fiber, and nutrient dense! Step 2: Get your vitamins and minerals from food! Follow MyPlate and get a varied diet with all of the food groups. Step 3: Learn how to read food labels so you can make the best choices that are lower in added fat, sugar, and salt (sodium). This poster makes a fun visual for any room or event! It is even perfect for Nutrition Month celebrations! To celebrate this fun new resource, I want to give you the handout that comes with it, for free! 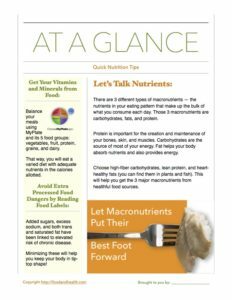 There are 3 different types of macronutrients — the nutrients in your eating pattern that make up the bulk of what you consume each day. Those 3 macronutrients are carbohydrates, fats, and protein. Protein is important for the creation and maintenance of your bones, skin, and muscles. Carbohydrates are the source of most of your energy. Fat helps your body absorb nutrients and also provides energy. Choose high-fiber carbohydrates, lean protein, and heart-healthy fats (you can find them in plants and fish). This will help you get the 3 major macronutrients from healthful food sources. 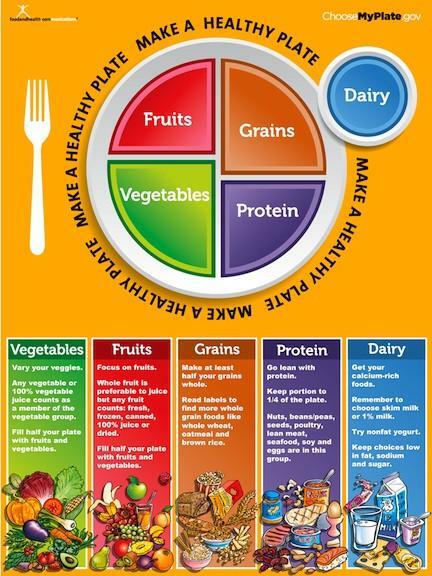 Balance your meals using MyPlate and its 5 food groups: vegetables, fruit, protein, grains, and dairy. That way, you will eat a varied diet with adequate nutrients in the calories allotted. Added sugars, excess sodium, and both trans and saturated fat have been linked to elevated risk of chronic disease. Minimizing these will help you keep your body in tip-top shape! Here’s a printable PDF copy of the handout! And here are a few fun nutrition resources from the Nutrition Education Store! I’ve just launched a few new MyPlate plates, and I couldn’t wait another moment for you to see them! 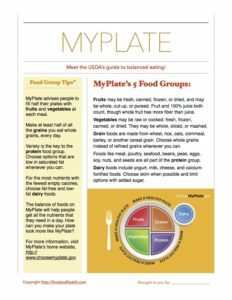 These MyPlate plates have been favorites of health and nutrition educators since I first came up with the idea a few years ago. After all, who wouldn’t want an actual plate to use while learning and teaching the key lessons of MyPlate? These new designs for portion control and kids highlight the importance of balancing eating patterns with physical activity, and there are great options for both adults and kids. In addition to being wonderful teaching tools, these plates are also perfect for prizes, cooking demonstrations, displays, presentations, and much more! 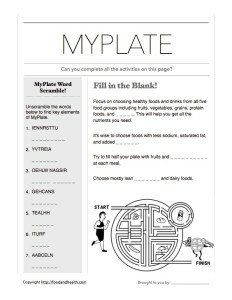 As a treat today, I’d like to share a MyPlate activity that you could do with any of these plates or even a paper plate. Are you ready? Assemble your group, pass out the plates, and make sure everyone has access to the scissors and magazines. Explain that they are going to cut out pictures of food and then sort them into the appropriate areas of MyPlate. Kids MyPlate Activity Placemat - Pack of 50 - 8.5"X14"
I’ve been having so much fun designing new floor stickers for the Nutrition Education Store! As you know, every floor sticker comes with a free printable handout, and today I’d like to share one of the most popular ones with you. 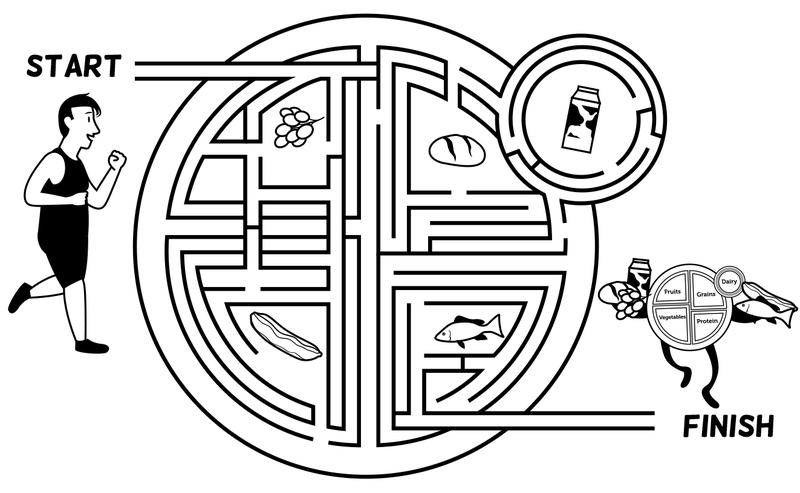 These floor stickers are perfect for cafeterias, break rooms, wellness fair booths, and even presentations. And handouts are as versatile as they come. The combination of both is one of my favorites because it appeals to a variety of learning styles and presentation formats. This can help make lessons more meaningful and easier to remember. Anyway, back to today’s free handout. 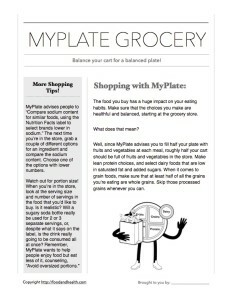 This handout covers the basics of MyPlate and was designed to go with the MyPlate Floor Sticker. I’ll copy the text of the handout below so that you can preview it, then, if you like what you see, keep scrolling for your very own PDF copy. Meet the USDA’s guide to balanced eating! Fruits may be fresh, canned, frozen, or dried, and may be whole, cut-up, or pureed. Fruit and 100% juice both count, though whole fruit has more fiber than juice. Vegetables may be raw or cooked; fresh, frozen, canned, or dried. They may be whole, sliced, or mashed. Grain foods are made from wheat, rice, oats, cornmeal, barley, or another cereal grain. Choose whole grains instead of refined grains whenever you can. Foods like meat, poultry, seafood, beans, peas, eggs, soy, nuts, and seeds are all part of the protein group. Dairy foods include yogurt, milk, cheese, and calcium-fortified foods. 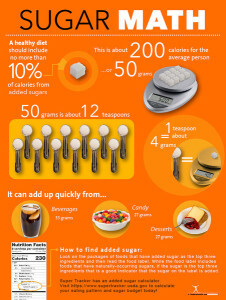 Choose skim when possible and limit options with added sugar. MyPlate advises people to fill half their plates with fruits and vegetables at each meal. Make at least half of all the grains you eat whole grains, every day. Variety is the key to the protein food group. Choose options that are low in saturated fat whenever you can. For the most nutrients with the fewest empty calories, choose fat-free and low-fat dairy foods. 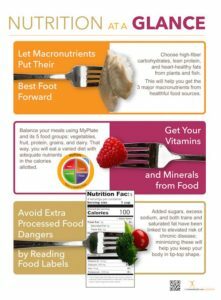 The balance of foods on MyPlate will help people get all the nutrients that they need in a day. 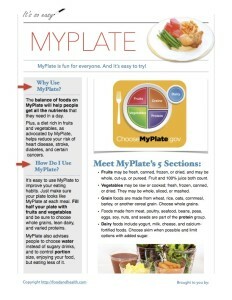 How can you make your plate look more like MyPlate? For more information, visit MyPlate’s home website, http://www.choosemyplate.gov. What do you think? Will this handout be good for your clients? Here’s a printable copy of the free MyPlate handout! And here are some more MyPlate resources, fresh from the Nutrition Education Store! Balance your cart for a balanced plate! The food you buy has a huge impact on your eating habits. Make sure that the choices you make are healthful and balanced, starting at the grocery store. Well, since MyPlate advises you to fill half your plate with fruits and vegetables at each meal, roughly half your cart should be full of fruits and vegetables in the store. Make lean protein choices, and select dairy foods that are low in saturated fat and added sugars. When it comes to grain foods, make sure that at least half of all the grains you’re eating are whole grains. Skip those processed grains whenever you can. My Plate advises people to “Compare sodium content for similar foods, using the Nutrition Facts label to select brands lower in sodium.” The next time you’re in the store, grab a couple of different options for an ingredient and compare the sodium content. Choose one of the options with lower numbers. Here’s a printable MyPlate handout that you can use however you see fit! And here are even more MyPlate educational materials, fresh from the Nutrition Education Store!